Without any previous knowledge, using an audio mixer can be intimidating. Here is a quick run through of the important features of a mixer, along with how to set one up with Switcher Studio. Below is a picture of a simple audio mixer. Not all mixers will look exactly alike, but many of the elements will be the same. First, let's understand each part of the mixer. Box 1 is where you will plug in your mics using an XLR or 1/4 inch inputs. (Most likely XLR). Box 2 is how you will control each mic's volume. On some mixers, these will be sliders (like Box 6). Box 3 will allow you to add additional volume to each mic if needed (Called the gain knob). Box 4 is where you will plug in additional audio sources if you need more than 4 sources on this mixer. Box 5 will control the volume of the 5th input. Box 6 controls the volume for all of the inputs on the mixer (Master Volume). Box 7 is the output you will connect to the iRig Pre (Main Out). Turn the volume down on all inputs. Do this by moving the dials in box 2, Box 3, and Box 5 to the left. Also slide the knob in Box 6 all the way down. Connect your audio inputs. 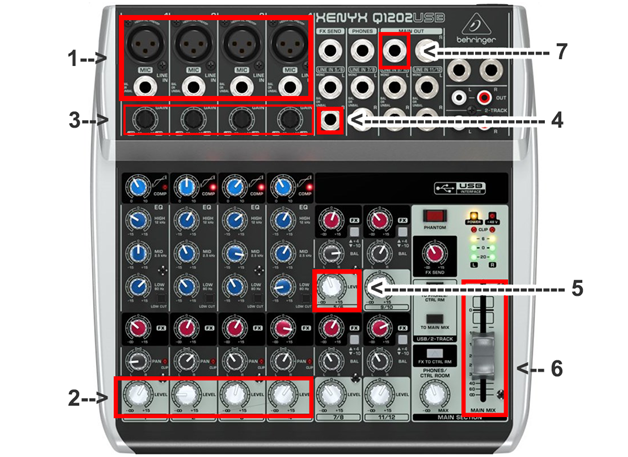 Plug in each mic to the inputs 1-4 in Box 1. 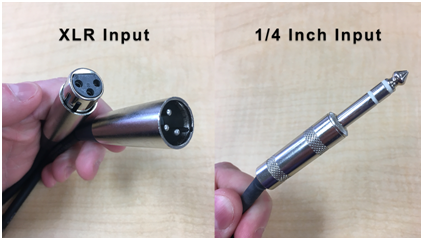 Most likely you will use an XLR cable, but a 1/4" cable can also be used. 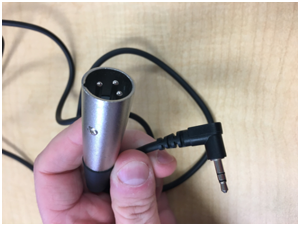 *Note that if you want to bring your computer in as a source, you will need to take a line out of your headphone jack on the computer. A cable like this will work (3.5mm to XLR). If you need more than 4 sources, start using the additional inputs (Box 4). For inputs like these, you will have to use the 1/4" inputs. Connect the mixer to the iRig Pre. 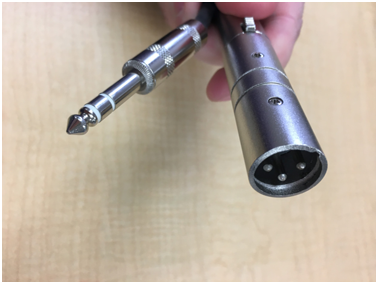 Using a 1/4" to male XLR cable. Plug the 1/4" side into Box 7 on the mixer and the XLR side into the iRig Pre. Make sure the gain knob on the side of iRig Pre is turned down all the way. 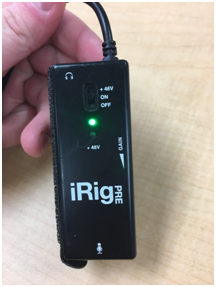 Plug headphones into the headphone jack on the iRig Pre so you can monitor your audio. Turn on the iRig Pre but DO NOT turn on phantom power. The toggle should be in the middle position and the red light next to +48 should NOT be on. Begin testing the levels of your mics. Start by sliding the knob in Box 6 up to the 0 mark. Next, turn on the mic that is plugged into input 1 of the mixer and use the white knobs in Box 2 to turn the volume up by turning it to the right. Try not to go past 3/4 of the way up. If you still need more volume, use the knob in Box 3 to increase the volume more. If you still cannot hear audio in your headphones, bring the gain on the iRig Pre up a little bit. Once you have good audio in your first mic, repeat the process for the rest of the audio inputs. Note that your 5th input's audio will be controlled by the knob in Box 5. Once all of the audio levels sound good, plug the iRig Pre into your iPad and launch Switcher Studio. Make sure you connect the audio BEFORE launching the app. You can check the levels of your audio in the app by watching the volume bar at the top of the app. Make sure it isn't in the red for long periods of time as this can hurt the sound card in the iPad.